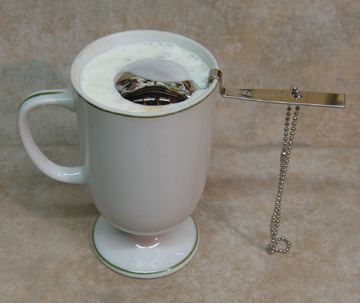 See our "Half and Half" Pouring Spoon for Irish Coffees, and mixed drinks. 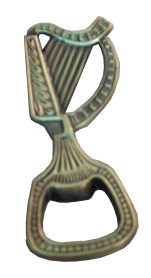 Irish Harp Celtic Bottle Opener. The Harp is both the national symbol of IRELAND and its province Leinster. Approximate Size 4" by 1.5". Black and Tan: Half and Half Traditional Recipe: Carefully pratice to perfect a layered drink. First with you beer glass at an angle, pour a 1/2 glass of Lager beer. Then, using the special pouring spoon, slowly trickle Stout beer over the back of the spoon so that the beers don't mix. Irish Celtic Pouring Spoon: Half and Half. Our pouring spoon helps you properly prepare Irish Coffee and fancy beer drinks called "Half and Half" and "Black and Tan's". Approximate Size 4.7" by 1.8. Includes traditional ball chain for hanging from the bar. It is also a very interesting Xmas ormanment. Hot Strong Coffee is poured into a warmed whiskey glass, sugar is added to taste (2 teaspoons), add one shot of Irish Whiskey, and stir. Then, using a pouring spoon, (bowl is upside down), add a tablespoonful of double cream is poured slowly over the Coffee so that it floats on the surface. If double cream is not available, use heavy whipping cream, whipped with additional sugar.